This is my Champion Juicer. I found it at a resale shop. I don’t think the employees knew what it was. 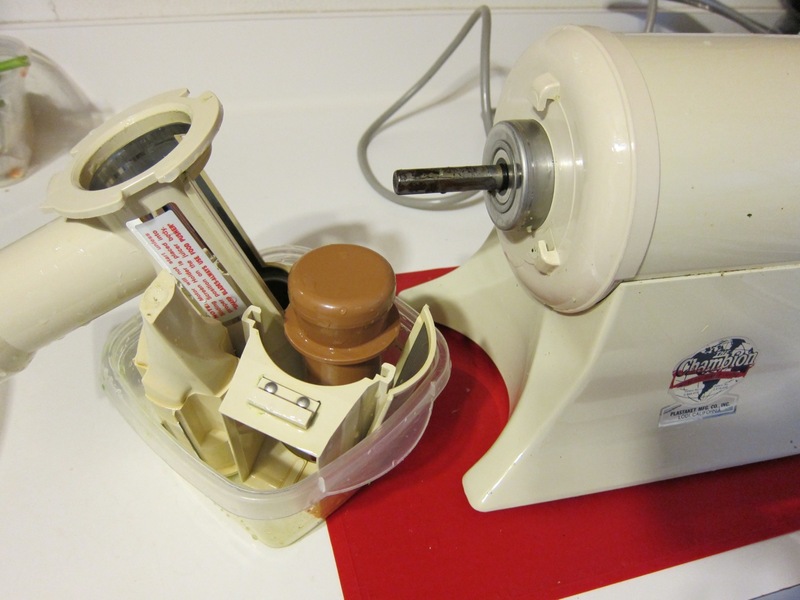 When I checked out, the cashier thought I was buying a meat grinder. 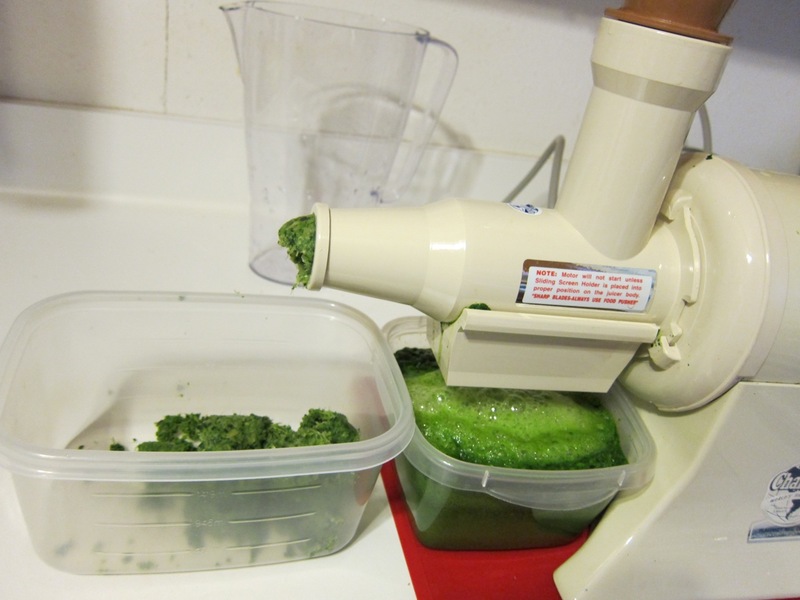 I had been on the lookout for a masticating juicer for a while and was so, so happy I found my Champion. 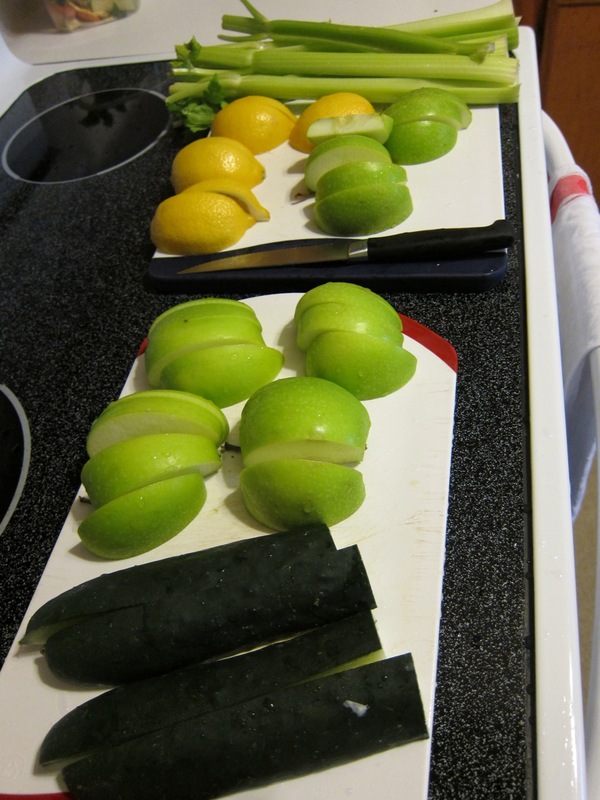 This is what I juice for two batches of green juice. 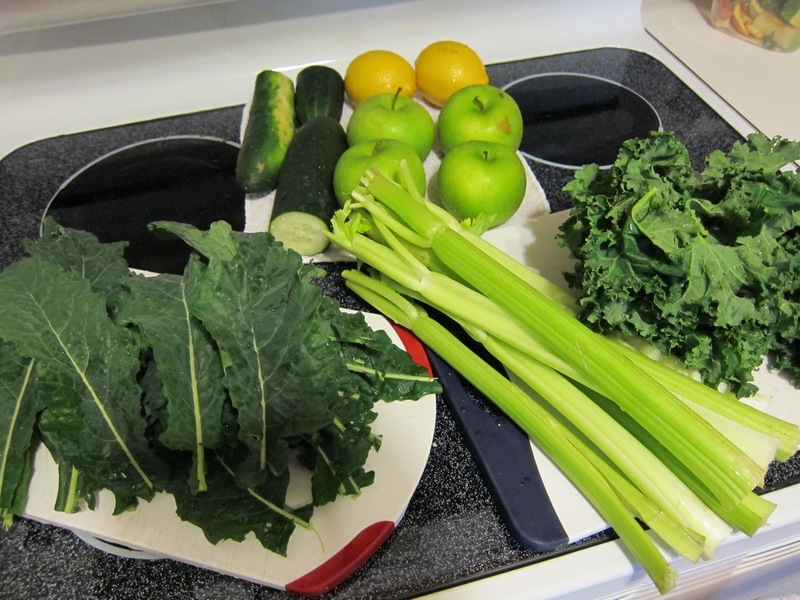 The kale on the left is from my garden and the kale on the right is from a grocery store. I really love my garden’s kale. 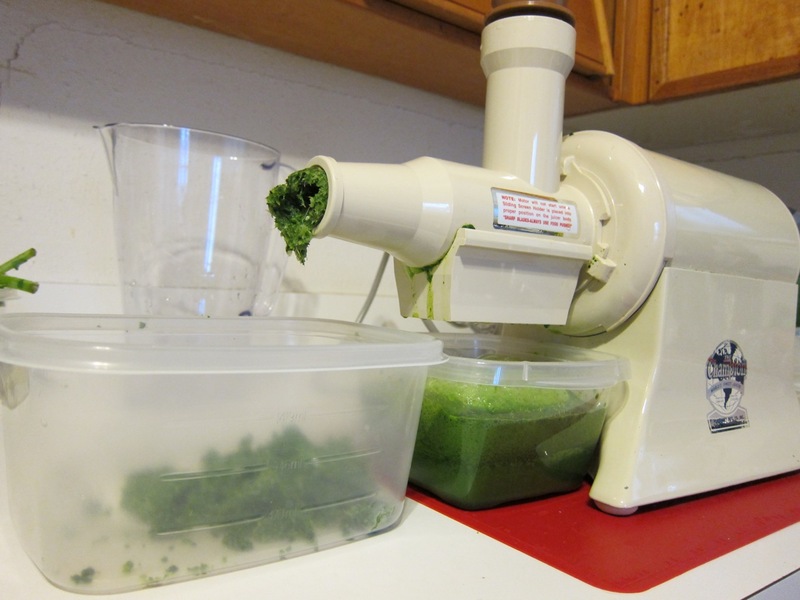 It’s fantastic eating straight from the garden, and it also goes into the juicer really well. 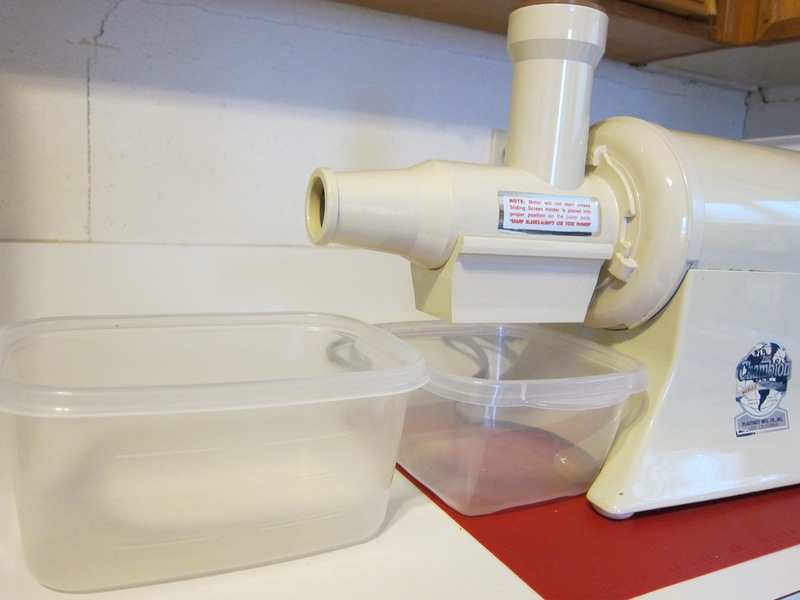 I put two containers under my juicer. 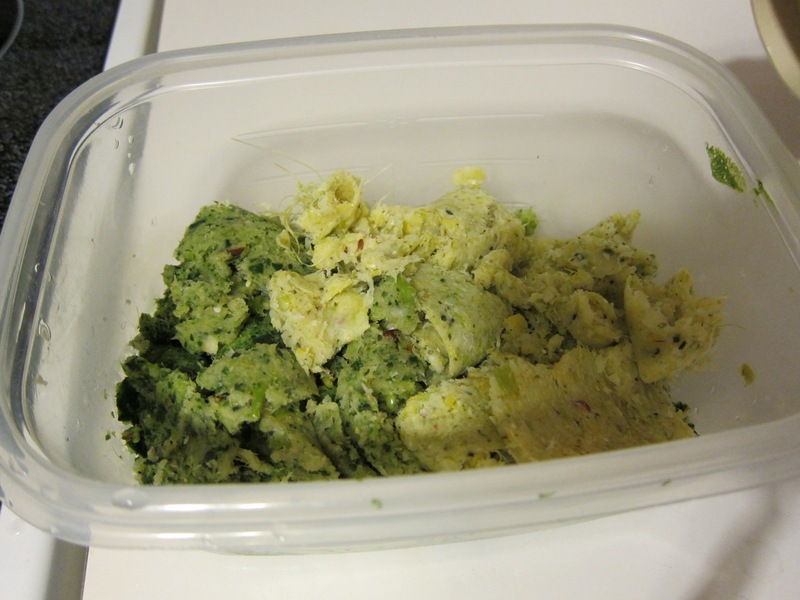 The one on the left is for pulp, which later goes into my compost bin. The container on the right is for the juice. The container on the right holds about 24-30 ounces of liquid, give or take. It’s enough to fill up a spaghetti sauce jar with some left over. This is everything cut and ready to go. 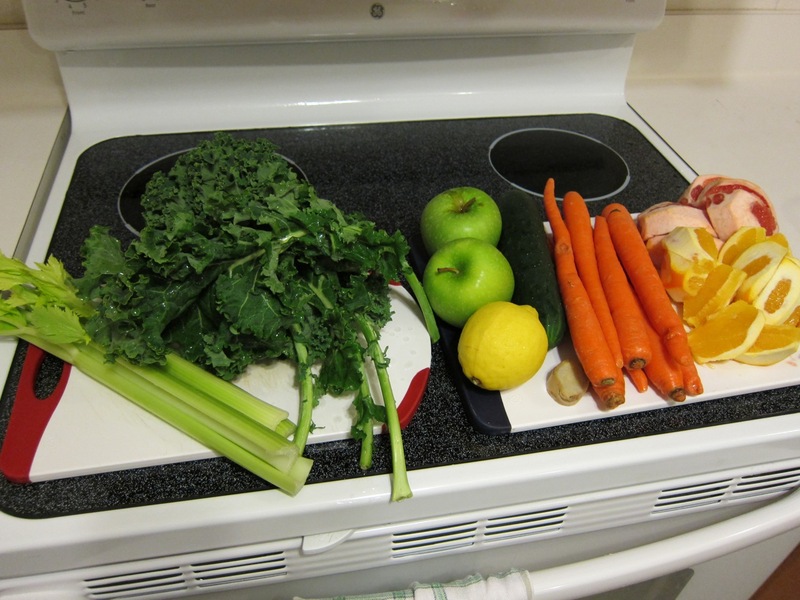 The kale and ginger were already in the juicer when I took this photo. 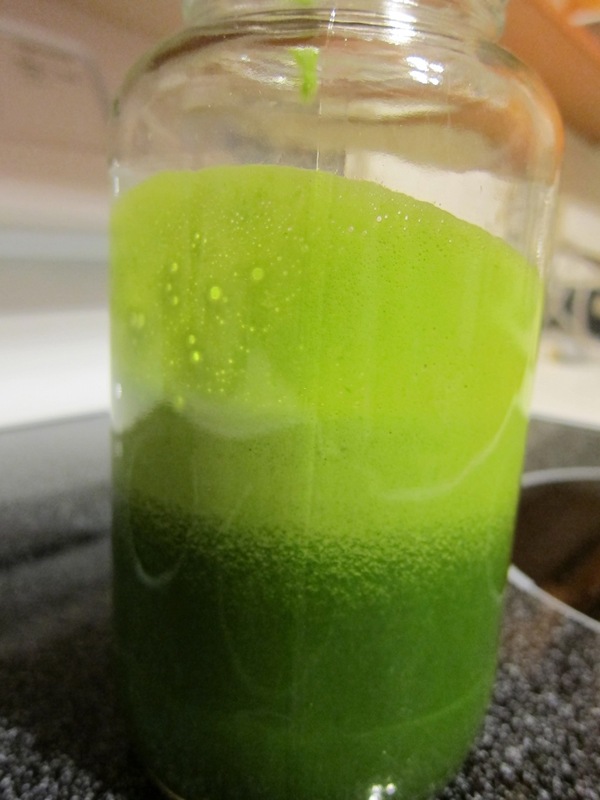 This is about how much pulp I got from the juicer (from all those fruits & veggies). 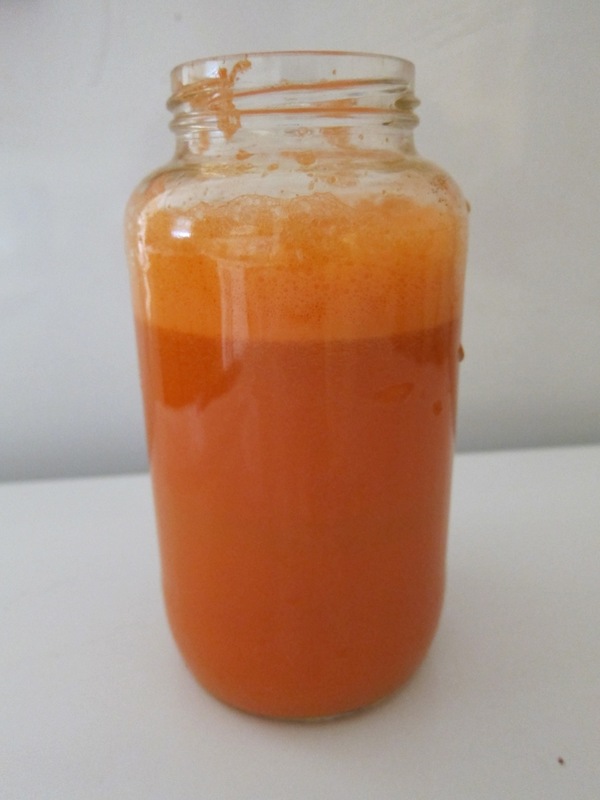 After juicing, I rinse everything off so it doesn’t harden and be a real pain to clean later. 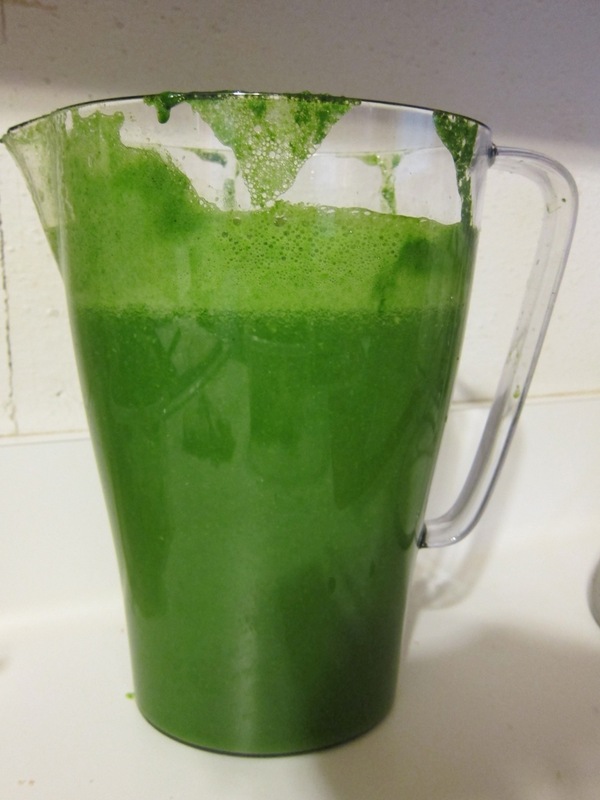 This was the juice for two batches of green juice. 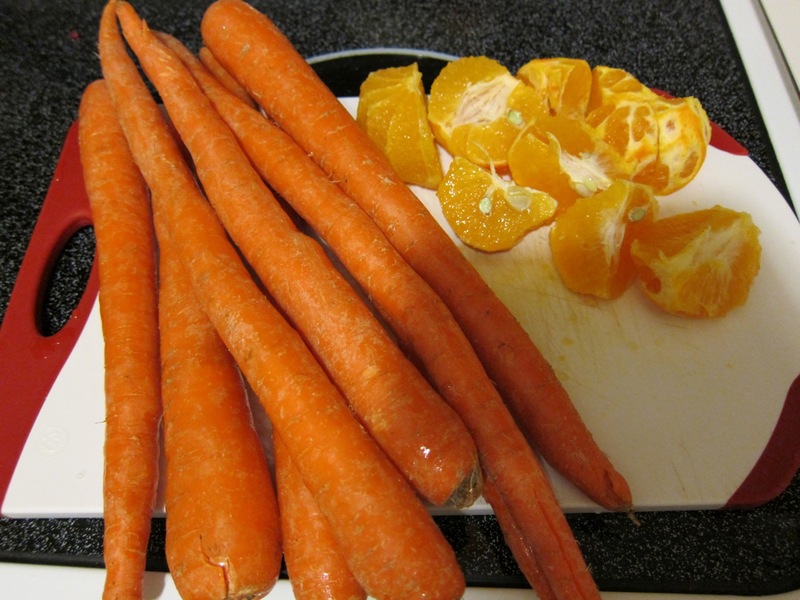 When you buy 10 pounds of organic carrots from a warehouse store, you have to use them! I juiced them with tangerines or oranges, whichever I had on hand. I usually did 8 carrots with 2 oranges. Sometimes, I would have the juice for breakfast and sometimes I’d take it for a snack at work. Whenever I bring out a jar of raw juice, my students come over to check it out. I always let them smell the juice before I have some. They thought the carrot juice smelled good. They weren’t so sure about green lemonade!